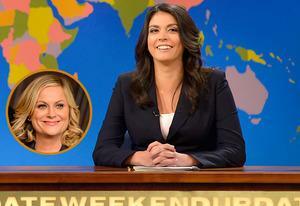 What Does Amy Poehler Really Think of Cecily Strong on SNL's Weekend Update? Cecily Strong has filled some mighty big shoes over on Saturday Night Live's "Weekend Update" desk. Before her, Amy Poehler and Tina Fey — arguably two of SNL's finest female comedians — set a pretty high standard. So what does Poehler think of her successor? "She's crushing it," the Parks and Recreation actress told TVGuide.com at the 100th episode celebration for her NBC comedy Wednesday. "She's so great. I sent her flowers on her first day and just wrote 'Strong, Strong,' because she's awesome. She's a huge talent." Strong made her official debut at the "Weekend Update" desk during the 39th season premiere, though she has been a fixture there since she joined the NBC sketch comedy series with her character "Girl You Wish You Hadn't Started a Conversation With at a Party." Strong might soon be alone anchoring "Weekend Update" since co-anchor Seth Meyers is leaving SNL in early 2014 to take over hosting duties at Late Night. "It's a time of transition, Seth is getting ready to leave," Poehler says of her former co-anchor. "She's just starting. I remember the early days of it, and it's a hard thing to get into a groove of, but Seth is such a pro and so good at it, I'm sure he's making her feel really good. She's going to be great. She's so great already and she's just starting." How do you think Strong has been doing as a "Weekend Update" anchor?